on Mondays, Wednesdays and Fridays for three hours each day. Starting this Friday, Ethan's school day will extend to five hours so that he can receive additional services from a vision specialist. Ethan continues to show us his strength and determination every day. He is making a recovery – albeit very slow. In addition to his regular therapies we have continued seeking various alternative therapies which are making a BIG difference for Ethan – Energy Touch and Acupressure (more to follow about these in a future post). 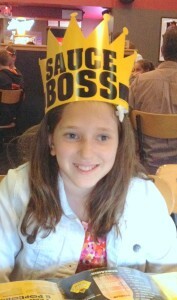 Our family life continues…as we celebrated Elyse's 11th birthday on April 30th. We marked her special day with dinner out at a restaurant of her choice (without Ethan, unfortunately) – she was all smiles for her birthday. Ethan was able to join her celebration this past Saturday night as Elyse had a small sleepover party. It is important that we try to maintain some normalcy while we continue to be thrust into a not so normal situation. We would like to welcome one of the newest members of Team Ethan — POTUS. A couple of weeks ago we were very surprised to receive a large envelope from The White House. 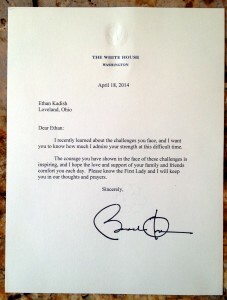 President Obama sent Ethan a letter offering his thoughts and prayers during this difficult time in his life. We are not sure if President Obama has also signed up with Lotsa Helping Hands, but if he wants to sign up to deliver a dinner or offer other help, he may need to wait in line. We have continued to be blessed with such a warm and caring community that offers help wherever and whenever we need it.